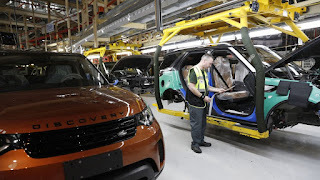 Car maker Jaguar Land Rover is to shut down its main plant for two weeks to reflect "fluctuating demand" - after sales to China were hit by the country's burgeoning trade war with the US. The Solihull factory, which employs 9,000 people, will cease production for a fortnight from 22 October. It comes after earlier this year 1,000 agency staff at the site were axed while another plant in Castle Bromwich saw production cut back to a three-day week. Latest figures showed JLR sold 57,114 vehicles in September, 12.3% down on the same month last year - with a slump of 46.2% in China blamed on "import duty changes and continued trade tensions" holding back demand. Sales fell 0.8% in the UK, 4.7% in Europe, and by 6.9% in North America.